One of our more popular yarns in recent years is a cotton/acrylic blend called JEANNEE WORSTED. This is a multistranded yarn – very soft- very easy to knit. The compostion makes for very comfortable summer knitting, and there are so many colors available. 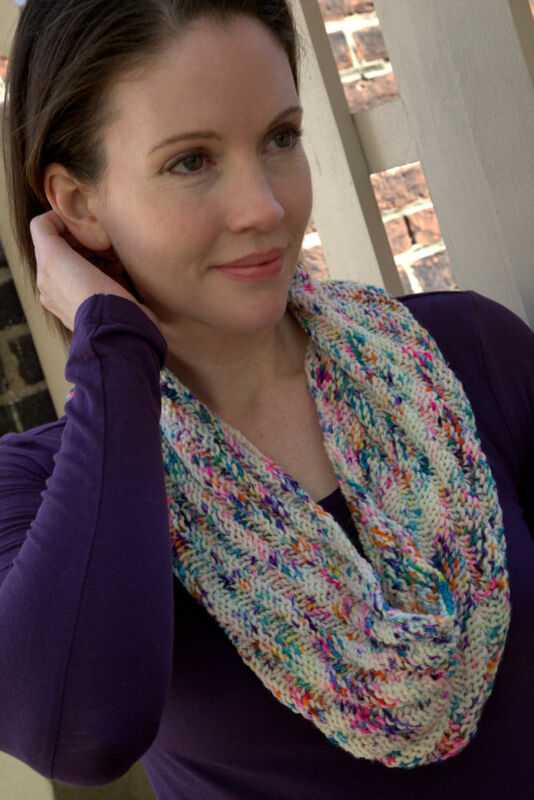 Riding on this yarn’s success, we added JEANNEE CHUNKY and JEANNEE DK to our line- up. JEANNEE CHUNKY is great for heavier cold weather garments- still light weight enough to wear inside, yet warm & cozy on the body. The DK weight version has been very well received as a substitute for the unfortunately discontinued Wildflower DK. JEANNEE DK makes up terrific baby sweaters. There are so many DK weight patterns available for babies as this weight is ideal for their size. 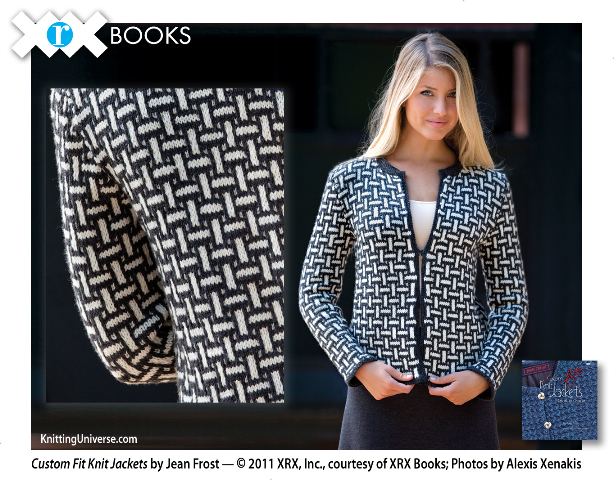 JEANNEE DK is a perfect, well priced yarn for this use. See the color cards on our website for a closer look at these yarns. Now for the driving gloves. One of our west coast sales reps called me one day last fall from her car. She was just killing time running her air conditioning, waiting for her steering wheel to cool down enough to drive. She said she wished there were light weight gloves to wear while driving. Well, why didn’t someone think of that? So, here is a pattern for lightweight fingerless gloves for those drivers who need to protect their hands while driving. I made the tops long to protect the pads on your palms and fingers. 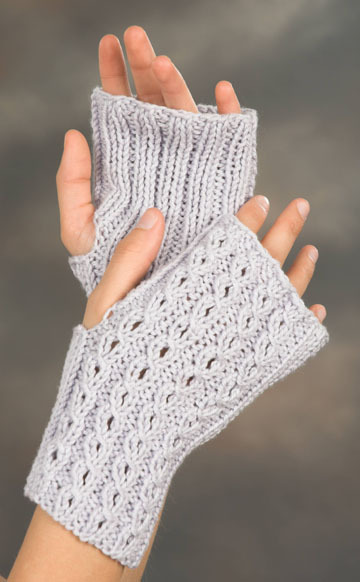 Knitted in Encore- these would make great cold weather fingerless gloves too. Knitting Needles: Size 6 needles. Gauge: 20 sts = 4” measured over st st on size 6 needles. With size 6 needles loosely cast on 46 sts. Row 1: *(K2, p2); repeat from * to last 2 sts, end k2. Row 2: *(P2, k2); repeat from * to last 2 sts, end p2. Row 3: K2, p2, *(K1, yo, k1, p2); repeat from * 3 more times, **(k2, p2); repeat from ** to last 2 sts, end k2. Row 4: P2, *(k2, p2); repeat from * 5 more times, **(k2, p3); repeat from ** to last 4 sts, end k2, p2. Row 5: K2, p2, *(Slip 1 knitwise, k2, pass the slipped st over the k2, p2); repeat from * 3 more times, **(k2, p2); repeat from ** to last 2 sts, end k2. Repeat rows 3-6 until total length is about 3”, ending with a row 6. Next row: K2, p2, *(k1, yo, k1, p2); repeat from * 3 more times, bind off next 6 sts, work in ribbing as established to end. Next row: P2, *(k2, p2); repeat from * 5 more times, casting on 6 sts over the bound off sts, **(k2, p3); repeat from ** to last 4 sts, end k2, p2. Repeat rows 5 & 6. Begin working rows 3-6 again until length from thumb hole bind off is about 3½”, ending with a row 6. Bind off in ribbing as for row 1. Row 3: K2, *(p2, k2); repeat from * 5 more times, p2, **(K1, yo, k1, p2); repeat from ** 3 more times, end k2. Row 4: P2, *(k2, p3); repeat from * 3 more times, **(k2, p2); repeat from ** to last end of row. Row 5: K2, *(p2, k2); repeat from * 5 more times, p2, **( Slip 1 knitwise, k2, pass the slipped st over the k2, p2); repeat from ** 3 more times, end k2. Next row: K2, *(p2, k2); repeat from * 3 more times, bind off 6 sts for the thumb hole, p2, **(K1, yo, k1, p2); repeat from ** 3 more times, end k2. Next row: P2, *(k2, p3); repeat from * 3 more times, **(k2, p2); repeat from ** to last end of row, casting on 6 sts over the bound off sts. Begin working rows 3-6 again until length from thumbhole bind off is about 3½”, ending with a row 6. Bind off in ribbing as for row 1. Sew up side seam. Weave in all ends.